This is the sermon I preached at St. Timothy and St. Mark Lutheran churches on Sunday, Jan. 14. The text is John 1:43-51. There is a cycle of discipleship that causes the church to grow: First is Jesus’ invitation to follow him, followed by the invitation to come and see. Then we are told what we will see, which is akin to receiving teaching and growing in faith. When this cycle is perpetuated and reproduced over and over in the lives of Christ’s followers, the church grows. This may sound a little crass, but it’s like the message on a bottle of shampoo: lather, rinse, repeat. In today’s gospel reading we see the lather, rinse, repeat of discipleship. First, we have Jesus’ invitation to follow him. Jesus found Philip. Philip didn’t search high and low for Jesus. We cannot find Jesus. He isn’t lost, for one thing. Jesus finds us. After finding Philip, Jesus says, “Follow me.” That’s good enough for Philip. “What is not obvious is the mysterious, inward, hidden work of God in creating each and every disciple, regardless of outward [means]. This first principle of discipleship is “obvious” only to those who believe—and even, then, not as something that is rationally explained, but simply confessed.” (Kuhl). Next is Philip’s invitation to come and see. Just as Jesus found Philip, Philip found it necessary to find his friend Nathanael. The news about Jesus was something he just couldn’t keep to himself. There are two parts to Philip's witness: 1. Jesus is the fulfillment of scriptures and 2. Jesus is the son of Joseph from Nazareth. By "sight" he is the son of Joseph from Nazareth. By "faith" he is the Son who has come from God (Stoffregen). How did Nathanael respond? “Can anything good come from Nazareth?” That seems negative, doesn’t it? The second title of Jesus, son of Joseph from Nazareth leads to Nathanael's prejudicial attitude about people from Nazareth (v. 46), which might be contrasted with Jesus' positive statement about Nathanael (v. 47) (Stoffregen). Nazareth was a village of 200–400 people, like other villages, it was economically dependent on the city of Sepphoris, the capital of Galilee at that time. The Hebrew Scriptures never mention Nazareth, and certainly don’t associate it with messianic expectations. Nazareth, then, gave no special status to its inhabitants, so when Philip told Nathanael that Jesus was the one of whom Moses and the prophets wrote, Nathanael figured that Philip had to be mistaken, since Jesus was the “son of Joseph from Nazareth” (John 1: 45). In Nathanael’s view, Jesus could be nothing more than a simple Jew from an insignificant village in Galilee. The Messiah would certainly be of more prominent parentage and come from a more significant town (Hoppe). Philip demonstrates a good evangelistic principle for us. 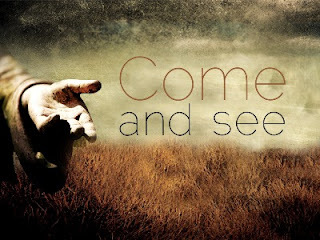 Rather than getting into an argument with Nathanael about Jesus, he issues an invitation to him to “Come and see.” When Nathanael takes Philip up on his challenge, Jesus says to him, “Here is truly an Israelite in whom there is no deceit!” What does that mean? To be without deceit is to be honest, especially about oneself. Then Jesus tells Nathanael that he saw him under a fig tree. Whether Nathanael was meditating, teaching or loafing, we don’t know, but Jesus did. Jesus knew him. This was overwhelming news to Nathanael, indicating that Jesus had some supernatural knowledge. Jesus knows us—warts and all. He knows what we’re struggling with, what we’re joyful about. He knows us through and through and calls us beloved. The third step in the discipleship process is, when we believe, we see greater things. In the final verse of today’s gospel reading, Jesus tells Nathanael, “Very truly, I tell you, you will see heaven opened and the angels of God ascending and descending upon the Son of Man.” This is reminiscent of Jacob’s dream in Genesis of the ladder with angels ascending and descending on it. But the place where we now meet God is not in the ladder of Jacob’s dream, but in Jesus Christ, who himself is the ladder between heaven and earth. “Nathanael will see greater things, like Jesus putting others’ lives before himself. Jesus will be the King of Israel (“King of the Jews” in 20:19) who puts the salvation of Nathanael, and Mary, and John, and you and me, ahead of his own life. He will be the Son of God and King worth being impressed by…” (Cornell). Jesus transformed Nathanael from skepticism to confession and the possibility of even greater experiences (Stoffregen). When we get to this last verse, the “you” is not singular, but plural. Jesus is talking to a wider audience than simply Nathanael. He is speaking to us as well. Last Sunday we heard about Jesus’ baptism, and now we have heard about his calling of the disciples. Jesus has found us in baptism and issued us the call to follow him. This Sunday’s gospel reading calls Jesus, son of Joseph, Rabbi, Son of God, King of Israel, and Son of Man. To speak the mystery of Christ, we need many titles. Early followers of Jesus in the first and second centuries were not rich, influential or well-educated. They were often quite the opposite. The reason the church grew exponentially was because of their witness, their sharing of their faith, even at the potential cost of their lives. The same holds true for us. We don’t have to be anyone special to share our story of faith. Think specifically and intentionally about what in your life reflects Jesus. How can you invite people to experience Christ through you during the week? There are a number of ways to witness to God’s love. You can commit to praying with someone. You may invite a friend to join you in serving the community through volunteering at a shelter, literacy program or other organization. In the coming weeks, you will hear more about an opportunity to help school children in Bemus Point, called 5 & 2. And of course, you can always invite someone to worship. Do you know what the main reason is that most people come to a church for the first time? It is because someone, usually a friend or relative, has invited them! This is often difficult for us as Lutherans. But when we think about the future of this congregation, we need to consider the importance of multiplying disciples. We can learn a lesson from some of our neighboring churches. In my past life, I had a “come to Jesus” experience. Like my peers who had experienced a conversion to Christ, we couldn’t help but share what God had done in our lives. People who go to the non-denominational, charismatic and Pentecostal type churches are indoctrinated with the importance of telling others about Christ. It is presumed that if you are a Christian, you will do that. Because members do that, more people come. Jesus has invited us to follow him. He has invited us to come and see what He is all about. “…when it comes to Jesus, it doesn’t stop with come and see, but always moves to the deeper invitation to come and be. Be what God has called you. Be the person the world needs… Be the beloved child of God who invites others to a similarly transformative experience of relationship with Christ” (Lose). Now it is our turn to respond to God’s call to us by inviting others to follow Jesus, to come and see what God has done in us. What might our lives and church look like if we all did this? God has so much more in store for us than we can ever ask, or think or imagine. And the best is yet to come. Martin Luther, Defense and Explanation of all the Articles (1521), LW vol. 39.